With the change of seasons upon us (finally! ), there is no better time to swap out our current beauty routine for even more nourishing and moisturizing skincare. 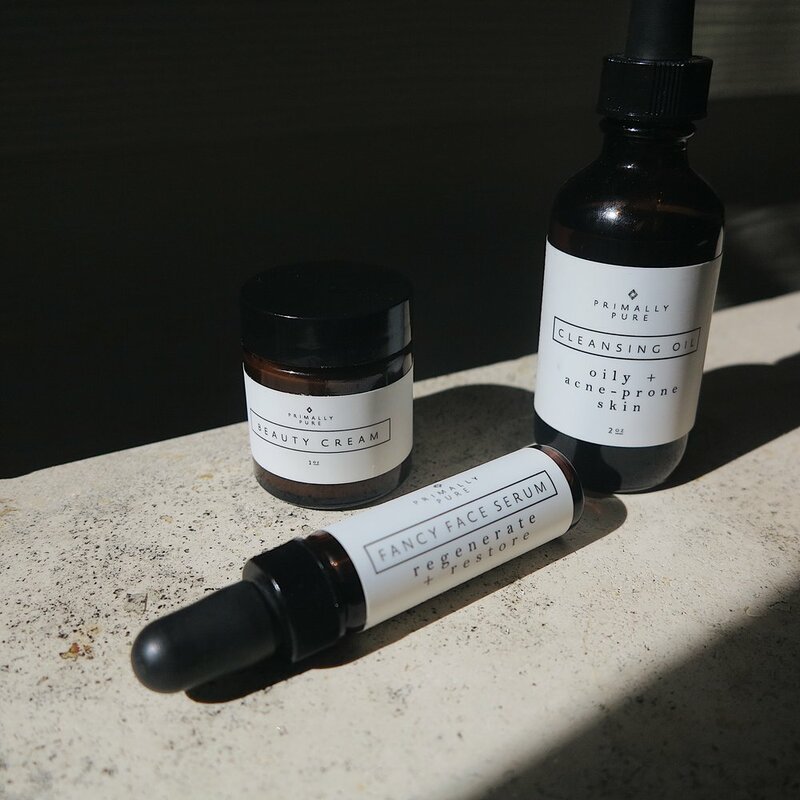 And if you still haven't made a transition to a non-toxic routine, I hope this post will be the boost you need...because, Primally Pure is that good. I'm having trouble putting into words how much I am in love with this skincare line. After 6 weeks of use, I still can't believe how much these products have changed my skin. I have struggled with oily, acne-prone skin throughout my 20's and after years of trying new products to no avail, I had accepted that those pesky chin breakouts were my reality. Having oily skin, I was incredibly skeptical to put more oil on my skin since that seems counterproductive, BUT, this Cleansing Oil has in fact done the opposite, effectively dissolving grime and buildup without stripping my sensitive skin. 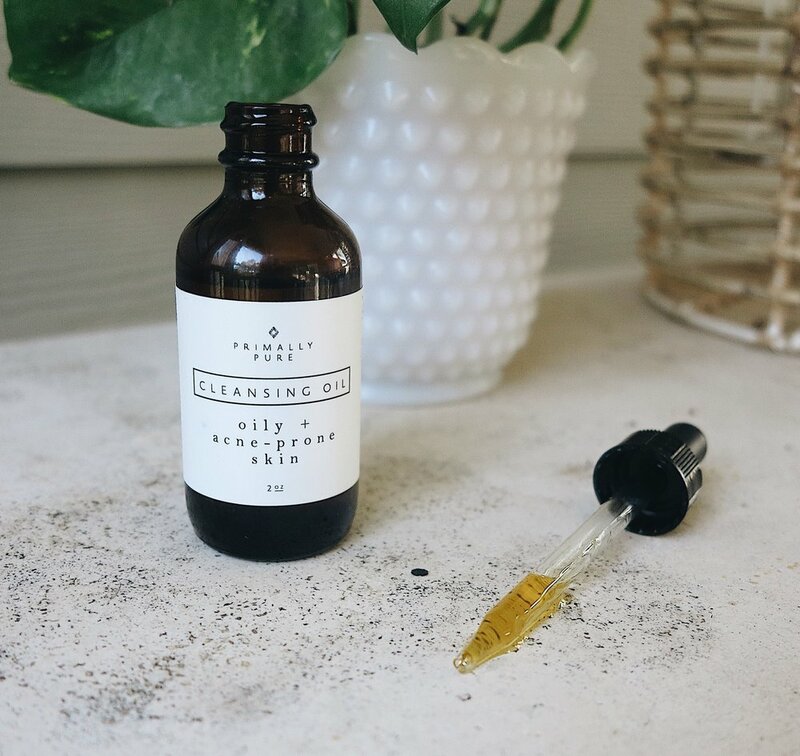 According to the natural skin gurus over at Primally Pure, when our skin is dry, it over-produces oil/sebum to compensate for the loss of moisture (read more on their post about oil cleansing here). I feel so jipped that I've spent so many years using cleansers promising to rid me of oils, thinking that was what was causing my breakouts. After a few nights of use, it was clear the combination of organic detoxifying oils were effectively penetrating those enemy pores, while still keeping my natural face oils intact. I've used it every other night for a little over a month and my skin is the clearest it's been in years. If I could use one of their products for the rest of my life, it would be this antioxidant superstar. A potent cocktail full of 17 vitamin and antioxidant-rich oils, the Fancy Face Serum has lightened sun spots and acne scars, evened out redness and reduced the appearance of fine lines around my eyes in just 6 weeks. My skin is so smooth and glowy the morning after using and others have started to take note, especially my partner who says he's never seen my skin this great. Pesky chin breakouts are not my reality, you guys! I could cry, I'm so thankful. If you want to invest towards your complexion, please I beg you, buy this guy. I was most surprised by this moisturizer, since it seemed too rich. I was nervous it would break me out or add too much shine to a face I already need to blot every day. However, upon reading that one of the 5 ingredients present was jojoba, a non-greasy oil, I gave it a go. I'm so glad I did. In addition to jojoba oil, this moisturizer contains a blend of responsibly sourced animal fats, and organic plant oils that work together to deeply moisturize and nourish the skin without clogging pores. 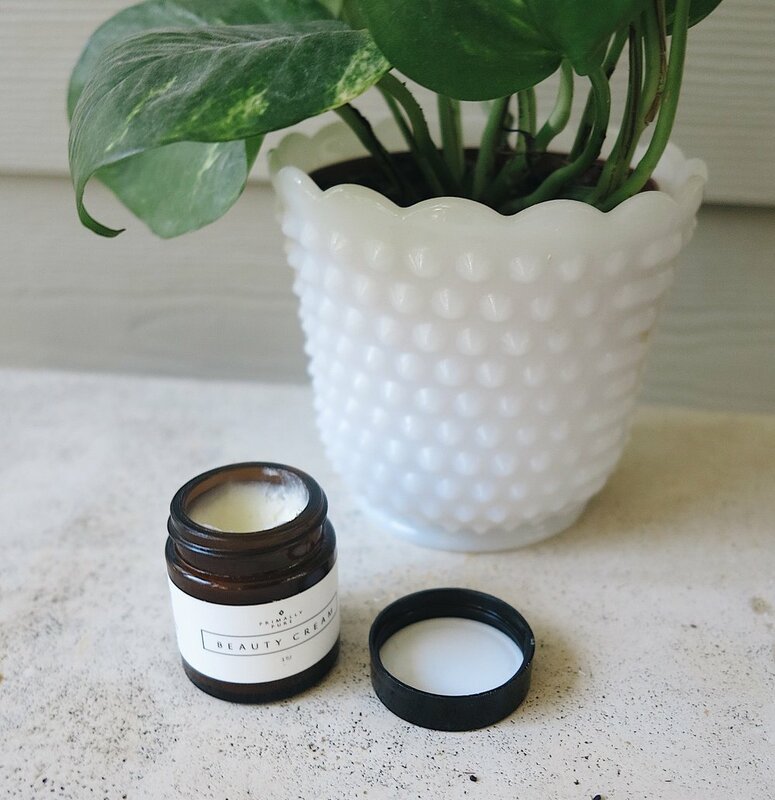 Tallow, a vitamin-rich animal fat from grass-fed cows, is the main ingredient in their Beauty Cream and the ingredient I feel most grateful for. Due to its unique similarity to the makeup of our skin cells and because of its high content of fat-soluble vitamins A, D, E and K, this ingredient made my skin visibly more elastic, plump and smooth. Emu Oil, another key ingredient in Beauty Cream, has powerful anti-inflammatory properties which is beneficial if you have a skin condition like eczema or psoriasis. I've struggled with eczema my whole life, and after a stress-induced patch on my eyelid a few weeks ago, I patted a small amount on the spot and it was gone by morning. The addition of peppermint oil soothes the skin and makes it feel oh, so luxurious and palmarosa helps to combat acne-causing bacteria because we've got no time for that! So was it too rich? Not at all. A tiny amount both morning and night provided my skin with some much needed nourishment that left my skin glowing, not shiny. Primally Pure's mantra is #natureissmarterthanscience and I couldn't agree more; nature won this one by a longshot. I am ditching my prescription retinols and serums to make room for the 3 products that have changed the way I look at skincare. Thank you, PP! Now, go ahead and invest in your complexion. You won't regret it.